Powerful enough for making quick work of your favorite ingredients, inspire your culinary creativity with CHEFTRONIC Stand Mixer. 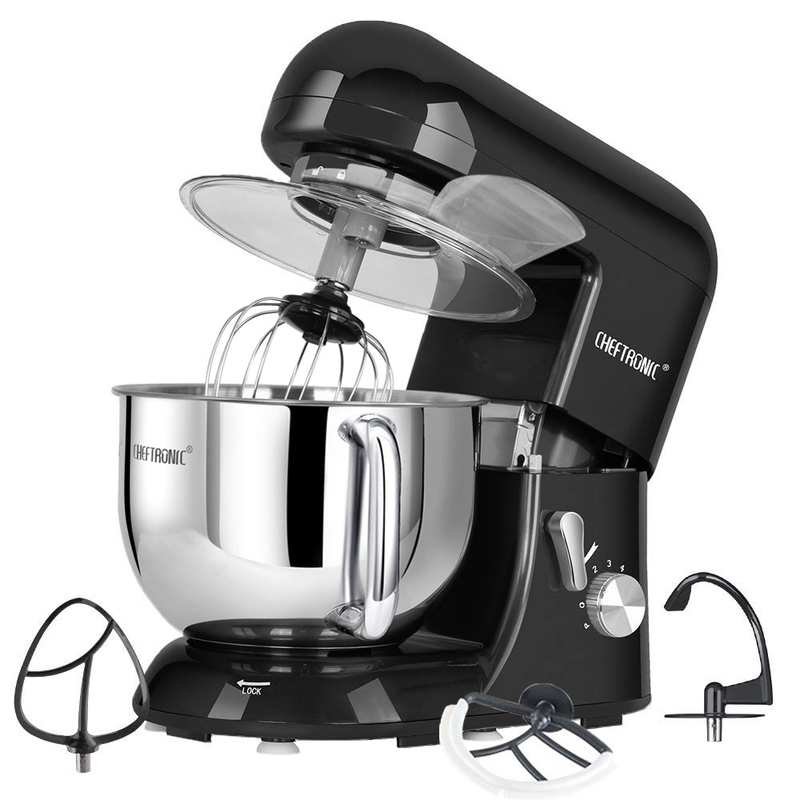 Equipped with four accessories including wire whip, C-dough hook, Y-shape flat beater, flex edge beater and pouring shield offering mixing versatility to blend, beat, whip, knead, mix eggs or cream. It does have a plastic body but that keeps the weight down and makes it easier to move around. The suction cups on the bottom hold the machine firmly in place. 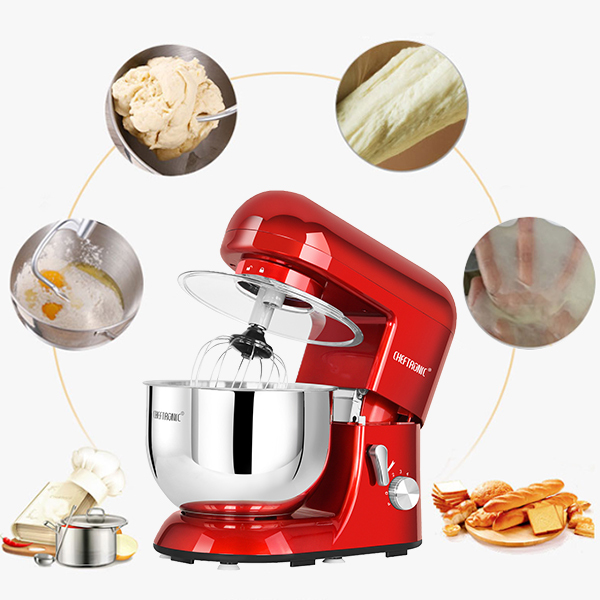 Safety protection, when the stand mixer is overheated, it will stop automatically till it cools. 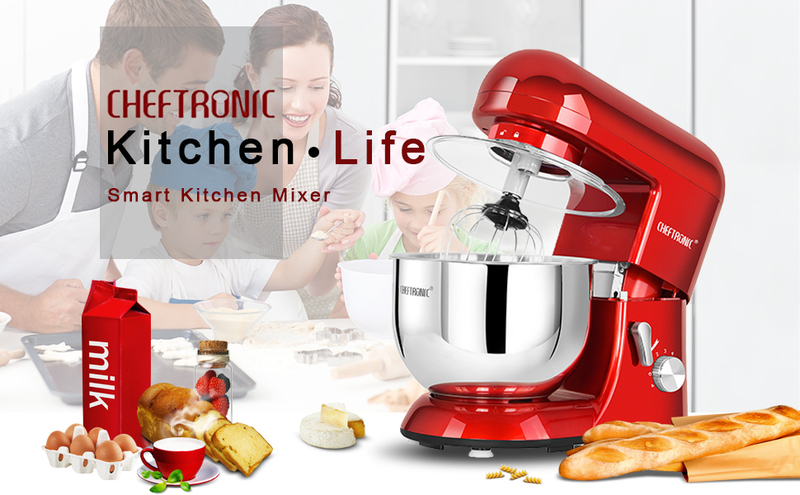 Particularly easy to operate and clean, good value for Cheftronic Stand Mixer. 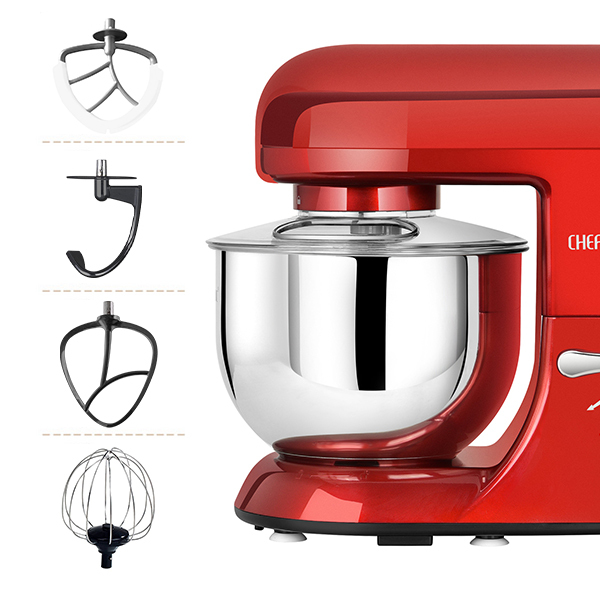 If you consider yourself a professional chef, a hobby cook or you simply like to have a go you can save yourself a lot of hassle, time and elbow grease with a Red Stand Mixer! 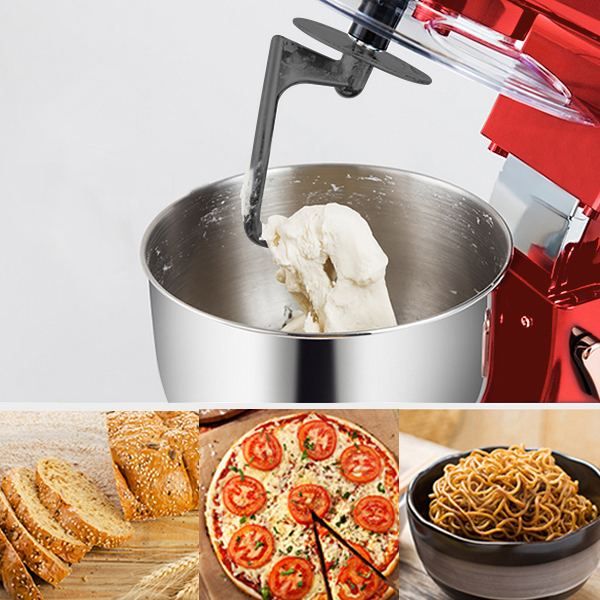 Kneading dough for bread or a pizza is no challenge for this mixer. 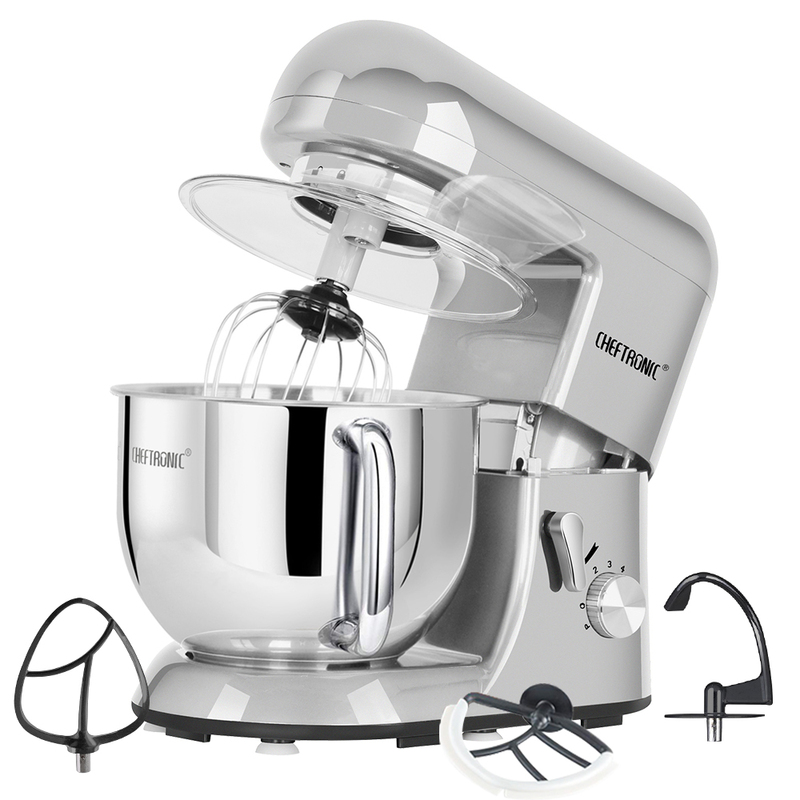 This kitchen mixer is capable of kneading, whisking, creaming, folding and so much more! With four different beater adjustments included as well as a transparent splash guard to cut down on mess, you'll have more time to enjoy the food you're making rather than slaving over a mixing bowl with a wooden spoon. 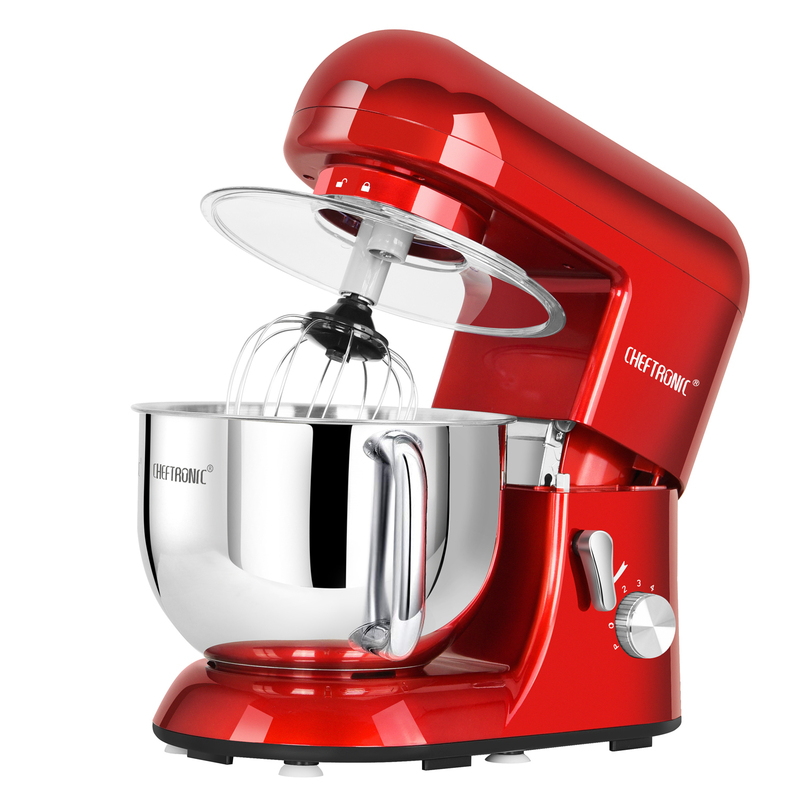 The stand mixer has a large 5.5 litre mixing bowl allowing you to mix up to 2kg of ingredients! 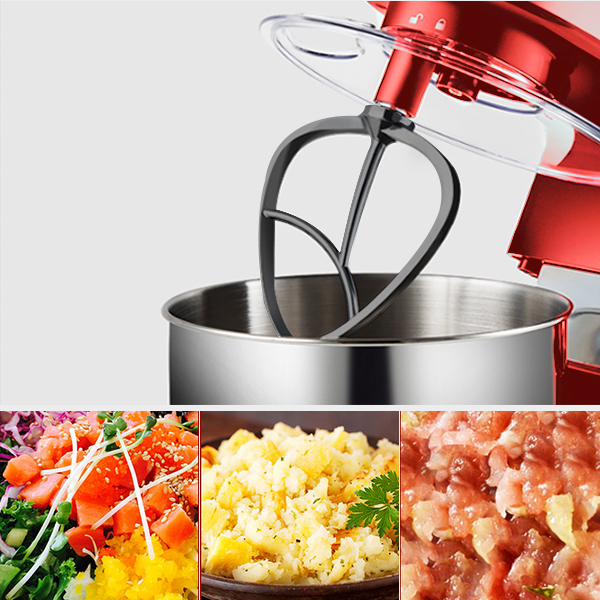 The powerful motor and quality manufacturing make up the perfect kitchen appliance for your mixing needs! This Cheftronic mixer is a timesaver that easy to use and no brainer to make one. Save you time and energy while providing outstanding result. The Flex Edge Beater is great scraping for more thorough, faster ingredient incorporation, including creaming butter, sugar and eggs to fluffy perfection, and preparing frostings and pastry creams quickly and easily. It also makes an excellent tool to wipe the bowl clean when pouring finished batters. The C-Dough Hook mixes and kneads yeast dough with ease, saving you both the time and effort of hand kneading. The Flat Beater is perfect for quickly and thoroughly mashing potatoes, mixing cake batter and cookie dough and so much more. 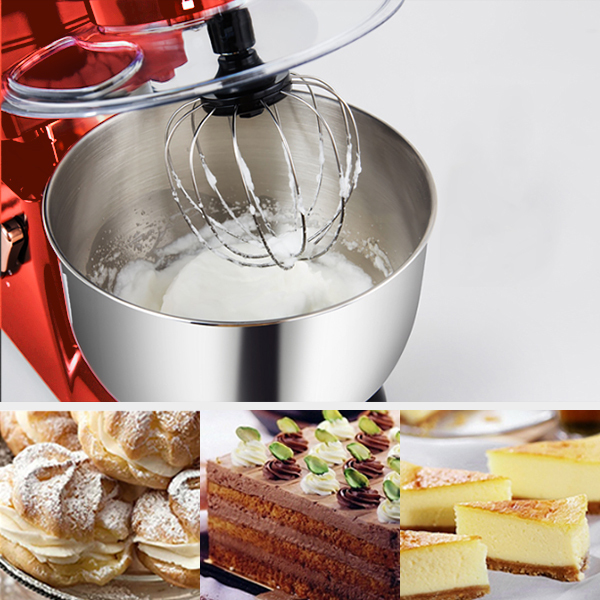 The Wire Whip quickly incorporates air into ingredients for fluffy whipped cream, perfect boiled frostings and cakes with whipped egg whites. Simulates kneading by hand, combined with the planetary track mixing. The dough will be fully mixed ingredients, to achieve the effect of turning rubbing, quickly make a variety of chewy full of dough. Middle of the "Y" structure, increasing the contact surface of the food, the ingredients will be mixed quickly to the need to reconcile the viscosity, great for general mixing such as cake batter and sauces. Planetary stirring trajectories allow the bowl to cover the mixing head when it is fully placed in the bowl, the air to enter the natural limits, easy to pass the whole egg, make cakes turn out better and lighter. What is the mixer made of, plastic, steel..? Does the plastic bowl cover come off? The instruction booklet is very unclear. Do you need to adjust the cooking instructions while using these to cook or do you just cook as normal? You just cook as normal. I also suggest using a non-stick spray. I have had my mixer since July 2017 and enjoy using it. However, the plastic on the flexible beater is separating from the beater. It is no longer useable. As I am approaching the two-year warranty period, I am hoping that other things don't begin to break. I am going to try to email the company about a replacement. I use this mixer for making pizza dough. Its bigger than what I expected, but the good news is that the mixer has enough weight and power so that it doesn't 'walk' across the counter as it kneads dough. Great value. I make breads, cookies and cakes that's it. I needed a stand mixer due to weakness in my dominant hand so I could no longer hold hand mixers. I did not need one that did 100's of other things and really did not want to pay $350. I read the reviews on this one on this sire and others and wanted to give it a shot. First off this one has more power tgan the artisian mixer I was looking at and was half the price. Second it came with the scraper paddle that kitchen aid charges $20 for. I made a three layer cake and two bowls of icing. This powered tgrough it with no problem. Made cookie dough that was thick, no problem. Love the shield and clean up was a breeze plus you get a warranty that is far better than its competitors. I love my mixer! It is nice to look at and works great! I especially love the no spill cover!